Manicured nails always make a good impression. 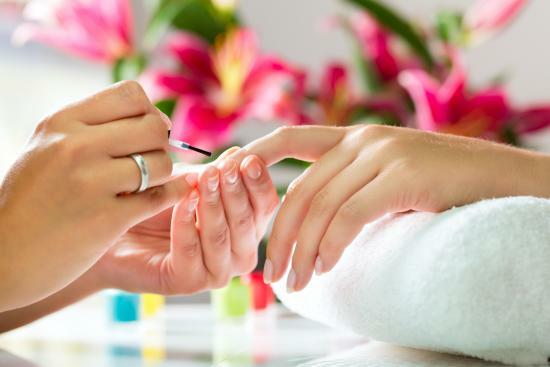 Our nail care experts will beautify your hands and feet with any of our soothing nail services. Soak nails in warm sunflower oil (instead of warm water), nail shaping, cuticle care, paraffin mask to replenish moisture and rejuvenate dry irritated skin and a soothing coconut moisturizer. Nails are buffed or polished for a clean finish. Nail shaping, cuticle care, a hot stone massage with oils to replenish legs and feet, a cooling mask to hydrate removed with hot warm towels, and a soothing moisturizer. Nails are buffed or polished for a clean finish. This restorative men's treatment begins with a contouring of nails and cuticles, followed by a foot and lower leg massage and nail buffing. Pamper your feet in our state-of-art Luxurious Foot Spa Pedicure chair. Dry manicure with nail shaping, cuticle care, hand massage with lotion and gel polish. Replenishes moisture and rejuvenates dry irritated skin. Nail shaping, hand massage with lotion and new polish. Includes a Classic Manicure and a Classic Pedicure. Includes a Spa Manicure and a Spa Pedicure. Includes a Gel Manicure and a Gel Pedicure. Includes a Gel Manicure and a Gel Spa Pedicure. Includes a Gel Spa Manicure and a Gel Spa Pedicure. Copyright 2013 Glow Skincare and Spa. We'd love to stay in touch with you! Enter your e-mail address below so that we can keep you up-to-date.